It’s pretty easy to take sound for granted. Sound is perhaps the most immediate of the classic five senses. You can’t ignore it. You can’t imagine it’s not there. You can’t close your ears like you can close your eyes. All you can hope to do is drown it out with more sound. Maybe because of this, sound plays a hugely important role in in the horror genre, where movies are acutely tuned to prey upon your senses and still twist the screws even if you cover your eyes. What if sound becomes the ultimate enemy? The snap of a twig, the shuffle of underbrush, the creak of a loose floorboard, the shattering of falling glass, all of it could be the last straw that signals your location to whatever malevolent force is closing in. Releasing this weekend, A Quiet Place is not the first horror film to put sound (or the lack thereof) at the forefront. And it surely won’t be the last. Directed somewhat surprisingly by one-time Jim Halpert John Krasinski, A Quiet Place marks his third directorial effort and first horror film, a massive shift in tone from his previous work. Set in the near future (around 2021 based on context clues), the film stars Krasinski and real life wife Emily Blunt as the head of a fragile household in a world terrorized by horrifying, murderous creatures drawn to your location by even the slightest sound. They have a silent existence, forever on the brink of ruin, eking out something like survival for more than 15 months. They use sign language to interact with their children, a meek son (Noah Jupe) and a defiant, deaf daughter (Millicent Simmonds). Krasinski diligently looks for any sort of weakness to subdue the lurking predators just out of view, but until he can, they must live in fear, but they must live. 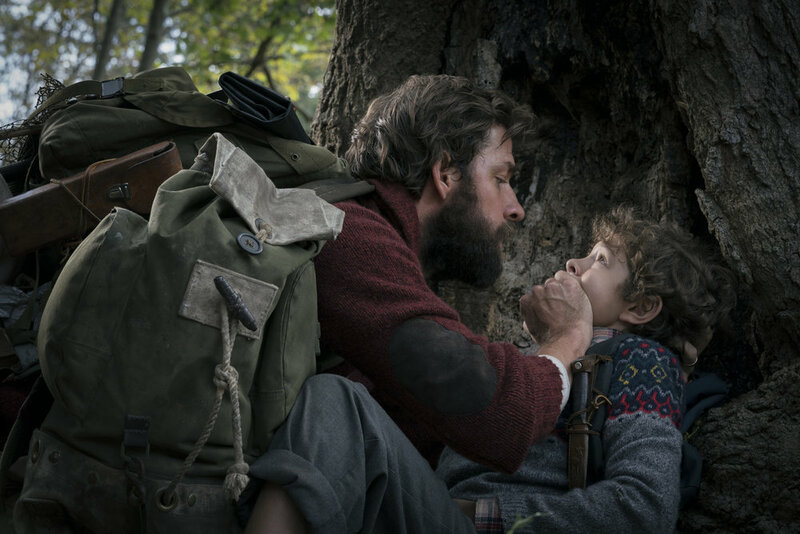 Watching A Quiet Place can be an arresting experience, as Krasinski takes the title to heart. The entire first act is free of dialogue (the first words you hear come from a Neil Young song listened to on headphones), and even when the film engineers opportunities for the cast to talk, those moments are few and far between. Instead, we just have to live in the silence of this world. That approach puts a lot on the shoulders of the four principal actors, stripped of the most explicit ability to make their thoughts and feelings known and left to rely on wide eyes and facial expressions. And you can do a lot with just wide eyes and facial expressions; Krasinski and Blunt don’t need much to convey their feelings for each other (it probably helps that they have just a bit of real world experience to pull from), and Blunt continues to prove an excellent choice for the woman with a reserve of strength you may not expect to be there at first glance (see also: Looper, Edge of Tomorrow). The children are particularly impressive, as you can tell the circumstances wound them so much more closely. Both young thespians had roles of note last year, Jupe as a side role in Wonder and Simmonds starring in Wonderstruck (yes, I’m aware), and Simmonds (who is deaf herself) continues to raise her profile here as a girl who is no stranger to silence but deeply frustrated about perceived guilt over an event that happened in the film’s prologue. When you don’t have the standard creature comforts of a movie to rely on, it takes all the more skill to engage an audience, and this cast has it in spades. Really, all you can do is squirm and wait for the other shoe to drop. The nature of the premise of A Quiet Place puts pretty heavy emphasis on jump scares, with sounds exploding out of nowhere to shatter the stillness and herald the coming of these alien beasts. This approach makes the film seem to fit in nicely with other recent creeping dread horror movies like It Follows or The Witch, though thanks to the jump scares, this one is in practice more about tension than dread. Cinematographer Charlotte Bruus Christensen has an excellent eye for framing, knowing exactly when to show us too much or too little. That’s especially key here, as we rarely see the monsters until it’s seemingly too late. There are some great set pieces as well (particularly one involving a grain silo); it’s generally nothing you’ve never seen before in the sort of home invasion thriller genre (there’s plenty of Signs in the second half of A Quiet Place, but, like, the good parts of Signs), but it’s pulled off with aplomb, and layering the silence gimmick over the top of it succeeds in making it feel a little more fresh. Some of the CG and monster design could use a little work at times, but the effectiveness comes from the carnage you see them wreak. I had written John Krasinski, film director off as somewhat of a lost cause after the utter banality that was his last film, The Hollars, but this is a Krasinski of a different mettle. If you end up going to the theater to check out A Quiet Place (and I really think you should), do the world a favor and leave the popcorn, the candy, the crinkly bags at the door. Stifle your coughs to the best of your ability. The immersion into pure, agonizing silence is key to getting the most out of Krasinski’s adept, intense thriller. A Quiet Place is not going to change the horror genre in any meaningful way, but it doesn’t have to. All it has to do is get that blood pumping and that pulse pounding, and it exceeds expectations offering a taut, engaging thrill ride.